The first Camino Festival in Australia! I met Tony Jacques at a desultory Camino dinner gathering in Sydney. I say desultory because everyone at the dinner was happy in their own self-appointed cliques. Newcomers like Tony and Ce were greeted cursorily, then ignored. Jennifer and I didn’t ignore them. 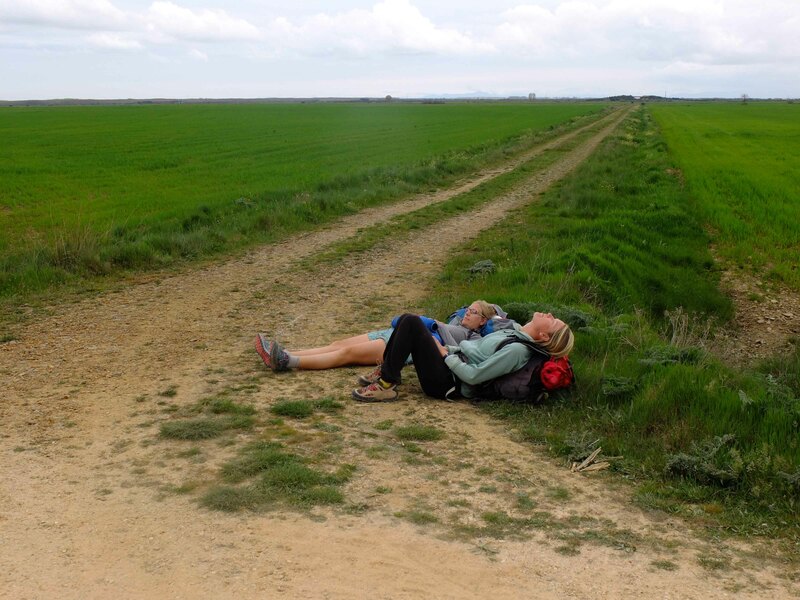 We chatted to them throughout the evening – and they told us they wanted to walk the Camino. Tony had Sleep Apnea, which would require him carrying heavy medical gear. Ce had two bad knees which would require replacements. We gave them some advice, and encouragement, and we wished them luck! We kept in touch later and Tony and Ce did walk the Camino. As I was to learn later, what Tony says he’s going to do, he does. Quietly, steadily, without fuss. Tony doesn’t present as a go-getter. He’s quiet, deferential, self-effacing – but that belies an intensity, a keen-eyed focus and a grit that, I discovered later, made him one of the military’s top bomb disposal experts, both in the UK then later in Australia. Military life also instilled in him formidable organisational skills. He and Ce live in the Blue Mountains, 2hrs drive west of Sydney. The next thing I know, Tony has invited Jennifer and myself to the inaugural Blue Mountains Supporters of the Camino dinner. They’d joined forces with a couple, Rowan and Margaret, who run the iconic Glenella – one of the Blue Mountains’ top restaurants/guesthouses, at Blackheath. We are here in the Blue Mountains to support all Caminos in Spain and we exist only to share the wonderful spirit of the Camino that so many of us call – life changing, wonderful and amazing…We try to emulate the dinners, conduct training walks in our local, beautiful Blue Mountains and help those who dream of walking and those who have walked and just want to know more, to understand the power and the healing that can be derived from this ancient pilgrimage. Join us to learn, listen, give back or get involved – everyone welcome! The evening was spectacular – it was informative, inclusive, and friendly. And it was supported by a yummy pilgrim meal, ala the Camino – prepared by Rowan and Margaret and their team of very talented cooks and servers. Word quickly got around the New South Wales Camino community, and the dinners became regular events. And soon they were sell-outs. Not only were they convivial opportunities to meet others with the “Camino Virus,” but Tony and Ce structured the evenings to include speakers who gave informative talks about their experiences, and for those wanting to walk the Camino, there was always plenty of information available. During this period I started to get a greater understanding of Tony’s personal qualities. He’s quite a remarkable man. But very low key. And humble. He and Ce walked a few more Caminos, and they began to broaden their Blue Mountain endeavours beyond just dinners – to training walks in the mountains, to informal get-togethers with pilgrims, and now…the first Australian Camino Festival! It’s a four day event, from February 23rd to 26th at Blackheath, Blue Mountains. Walks, talks, photography, workshops, food, wine, art & music of Spain and surrounding countries. There will also be opportunities to attend mass at local churches plus to meet with many other pilgrims or future pilgrims. The event will run over FOUR days and will include an EXPO on the Saturday where various people and organisations will showcase things enabling that camino experience. Jennifer and I will be holding a half hour talk on how the Camino can change you – that’s on the Saturday afternoon – then I’ll be doing a photographic workshop on the Sunday morning, concentrating on those particular challenges that will confront anyone wanting to take half decent photos whilst walking the Camino. The workshop will be based on my book, Photo Camino. If you’re even vaguely interested in the Camino, come along. It should be informative and fun. And there will be great Spanish-pilgrim styled food! It will be a wonderful opportunity for you to talk to those who have walked it – and find out what you need to know; everything from what to pack to how to handle blisters. This entry was posted in Post Camino and tagged AusCamino, Australian Camino Festival, Bill Bennett, Blackheath, Blue Mountain Supporters of the Camino, Camino Festival, Glenella, Photo Camino, Tony Jacques by Bill Bennett. Bookmark the permalink. Let me progress as it states the URL not available. Can you help me please I don’t want to miss out. Wow, envious… that’s all! 😉 have fun! Aw c’mon Ingrid – come over!! 🙂 Join us! my broom is in the repair shop… otherwise… I’d be right over. I too would like to attend but it’s a long commute and my transporter isn.t working either. A follow up post would be interesting and appreciated. Have a great time! Nice to find your blog about the Camino and your filming I’m currently reading through them. I know how healing on the Camino feels as I two had knee operation to remove cartilage doc only took 60% of mine and it seem to get so much better while on the Camino. Walking 20km+ per day seems to heal things a little. Time only permitted us 13 day so hoping to finish what we started 2017 or 2018. I would love to meet you at the expo and I’m interested in the photography workshop but more interested in the video side of things will you be doing and video talks?